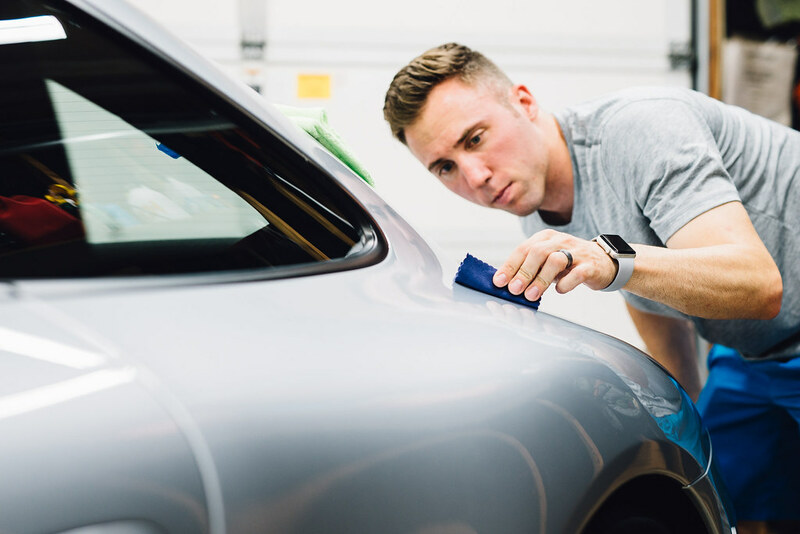 Paint coatings provide durable protection for your vehicle’s painted surfaces that help to enhance gloss, simplify maintenance, and resist dirt and contamination. Coatings have been on the market for a while now and the majority of detailing enthusiasts are very aware of their capabilities, but did you know that there are also coatings for your coating? Yes, you read that right… a coating for your coating! Gyeon Booster is exactly that. It is a paint coating that is meant to be applied on top of another coating to boost certain properties, hence the name “Booster”. You might be asking yourself, “Really? Another coating on top of my coating. Aren’t we getting carried away here?”. To be honest, I had the same sort of thoughts when I started seeing top-coats like Booster and other two-part coating systems coming on the market, but as always I was curious and wanted to give it a shot. 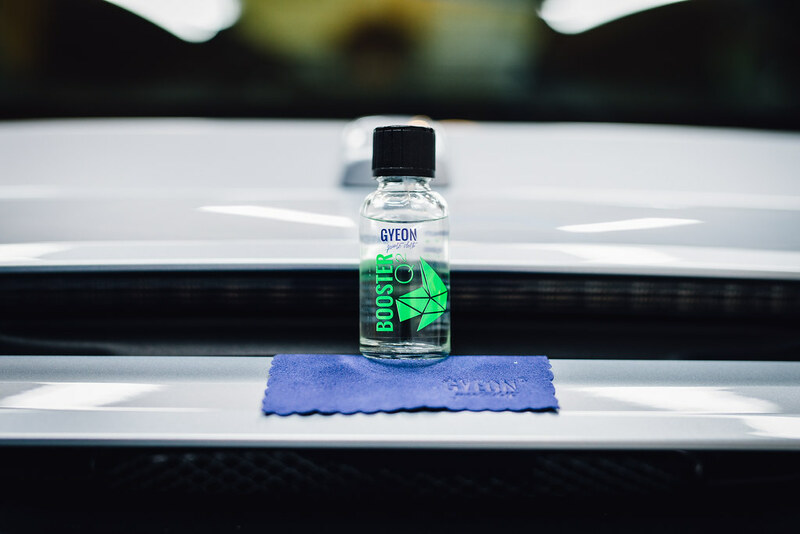 Gyeon claims Booster can help to enhance the durability and hydrophobicity of any quartz/ceramic coating, even if it is not within the Gyeon product line. They say that Booster will help to prevent one of the most common, and most annoying, issues associated with ceramic coatings – water spots. 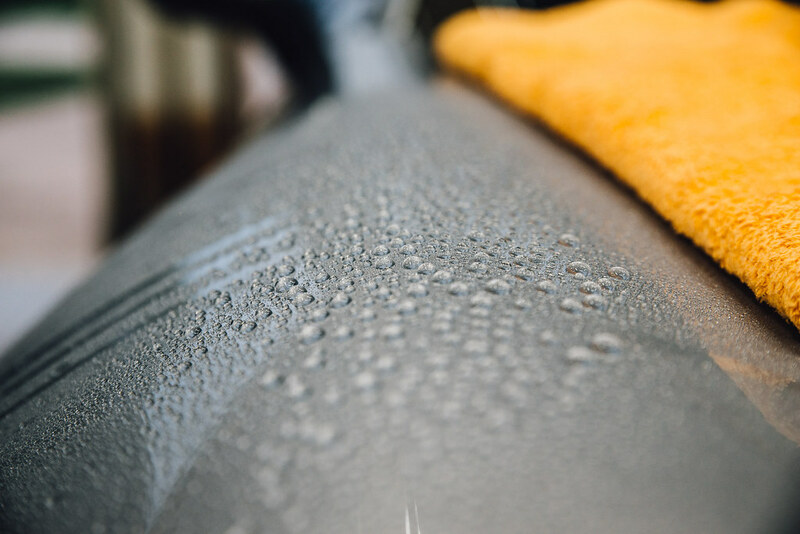 When used on top of an existing ceramic coating, Booster can help to provide up to 12 more months of hydrophobic properties. Booster is a fluorine-based product claiming water contact angles up to 120 degrees, so the water beading should be out of this world. You may apply Booster right after applying a fresh coat of your favorite ceramic coating like Gyeon Mohs, or you can even apply it several weeks later. It is important to note that this product is only meant to be used as a topcoat and not as a stand-alone coating. Gyeon Booster is available in only a 30 mL size and includes an applicator block and four applicator cloths. The instructions from the manufacturer are short and sweet, which made me hopeful that this would be a painless application. As I mentioned previously, Gyeon recommends that Booster is used shortly after the primary base coating has been applied, but it can also be used at a later date. It is recommended that Booster is applied to vehicles that have been driven no more than 2000 km (around 1,200 miles) after the initial coating. When applying directly after a base coat, simply wait at least 1 hour before beginning the Booster application. Ensure the surface is dust free before beginning. When applying to a vehicle that has been driven, begin with a proper hand wash utilizing pH neutral shampoos. Dry the car and then perform a thorough wipe down with Gyeon Prep. Apply a moderate amount of product to your applicator and spread the product onto a panel using criss-cross motions for even coverage. Wipe the panel immediately after application. Continue this process until the entire vehicle has been coated. Allow a minimum of 12 hours before driving the car or exposing to any sort of weather. I applied this product directly on top of a fresh application of Gyeon Mohs. This was my very first time using Booster, and I want to like this product, but I have some concerns. First and foremost, the product evaporates so quickly upon application that I found it to be absolutely impossible to tell where I had already applied product to and where I had not. In an attempt to ensure I had touched every part of every panel I found myself using a ton of product relative to what I would have generally used when coating a smaller vehicle such as this one. On the same note, because the product literally disappeared the moment it touched the paint, I could not see if I was spreading it evenly over a given section. I was concerned that either I was missing spots altogether or that I was not spreading it out evenly because there was no way at all to see the product. I was very caught off guard by this and even found myself touching my applicator several times throughout the process just to make sure it was, in fact, damp with product. I have mixed feelings on this whole application because it was insanely easy as there was almost no need to wipe the surface after spreading the coating, but on the flip side, I just can’t feel super confident that I did a good application without some visual feedback. I took this short video clip while I was working and I had not planned on using it for this blog, so I apologize for the very crude handheld footage, however, it seems to be the easiest way for me to demonstrate exactly what I mean. As you will see in the footage, I applied a very generous amount of coating to the applicator. After dusting off the area, I then chose one of the piano black sections of the roof to demonstrate as this darker finish should be the easiest to see any residual coating, however as you will soon see, there is zero residue whatsoever. At the end of the day, the biggest hurdle for me to get over is the lack of feedback during application. I really wish there was just a bit more time before the product disappeared to provide some visual confirmation that it had been applied evenly and thoroughly. Time will tell if my application was adequate or not. Assuming I was able to get good coverage with the product, I am excited to see how the water behavior holds up. This particular test vehicle will not be exposed to harsh winter elements or considerable mileage, so I would expect the hydrophobic properties to be superb for quite a while. Stay tuned for a follow-up article in the future! Despite the ‘faith-based’ application process, I actually enjoy the Booster application. Kinda gotta go by feel and trust that you have everything covered…oddly entertaining. It’s a nice combo with Mohs, kinda gives a nice ‘consumer-ish’ version of the pro-only Durabead product. “Thank you for your interest in Gyeon products. Q2 Mohs with Q2 Booster on top – which does not directly equal Q2 DuraBead as the Q2 Bead top coat has more concentration than the widely available Q2 Booster. Although this combo comes close. – slickness: lower than Q2 Skin, but still very high. Fun stuff regardless, and it works quite well. is Booster meant to be used in place of a product like Gyeon Skin (which is part of the Synchro system)? If I already have a car coated with Sychro (2 coats MoHs, 1 coat Skin), will I see any benefit to adding Booster? Yes you would use this in place of Skin. You won’t see any added benefit adding this on top of Syncro. Unless Skin has failed then that is a different story.